Average Weight	: 18 - 24 lbs. The Dandie Dinmont is an old terrier dating back to the 1700s, originating from the border area between England and Scotland. The breed may have been developed from the Skye Terrier and the now extinct Scotch Terrier (not to be confused with today's Scottish Terrier). The breed was popular among the gypsies and was used by farmers to kill vermin. With its short legs it was able to go to ground hunting badgers and otter. In 1814 Sir Walter Scott wrote about the breed in his famous novel "Guy Mannering." In the book there was a character named Dandie Dinmont, and that is where the breed got its name. It was recognized by the AKC in 1886. The Dandie Dinmont Terrier makes a very good companion dog for most small houses and apartments. They are loving and affectionate and will bond closely with family members. They are intelligent and somewhat willful at times, though fun loving and playful. While they are eager to please, if there is something that requires their attention, it will be difficult (if not impossible) to call them off. Generally, they do not take to obedience readily, and must be very carefully trained from puppy-hood to reliably respond to all but the most simple of commands. Like many small dogs, Dandie Dinmont terriers are dogs that seem unaware of their small stature. They will take on any challenge or take off after just about anything that moves in their field of vision. During show trails they may compete in obedience or Earth Dog exercises. Since Dandies are so plucky, they also have a tendency to bark quite a bit. Their chest cavities are large, so they have a much deeper bark than you might expect from such a small dog. They do not back down from a fight and should be very carefully socialized with other people and dogs from a very young age. The Dandie Dinmont is a natural hunter of all small creatures that scuttle about, so they are not to be trusted with any cats they've not been raised with or any other small pets such as ferrets or rabbits. When well socialized, they are rarely aggressive with other dogs except in the case of some intact males. It is recommended that two unaltered males not be allowed to share the same household. Females tend to be far less aggressive. However, it is still vitally important they meet other dogs while puppies so they do not become fearful, as they could become snappy. Above all, the Dandie is known as a very loving and affectionate dog that will be more than happy to please you as long as he or she isn't busy perusing some game. Dandie Dinmont terriers are generally a healthy breed and long lived, though there are a few lines of the breed that have congenital Health Problems. Epilepsy: Some lines of the breed have a tendency for seizures. They may occur as the result of some stimulus or have no apparent cause at all. Most dogs will respond to medication and should be taken to the vet at the first sign of a seizure. Glaucoma: Older dogs may develop Cataracts. If your dog seems to be displaying any cloudiness in the eyes, contact your vet for an exam. The Dandie Dinmont Terrier's coat is very silky in some parts and can become matted and hopelessly tangled in very short order if they're not regularly groomed. However, with careful management, your dog's coat will remain very warm and water repellent. A short walk is enough to keep them exercised, though it is important that you do so every day. Because of this, early leash training is very important. Training your Dandie to enjoy being on a lead will make the experience much more pleasant for both of you. Because they are so small and so inquisitive, it may very well be a good idea to get them a harness rather than just a collar. Even dogs that are trained to walk on a lead will leap after any cats or vermin that it encounters on your walk-often with such ferocity that they can harm themselves on even a short leash. If you have a yard, they can be allowed outside to play and are not usually very good escape artists. Even dogs that are allowed constant access to a yard will still need walks for mental stimulation just as much as the exercise. Though very few actually hunt anymore, they are ready to do so at a moments notice whether that's what you had in mind or not. 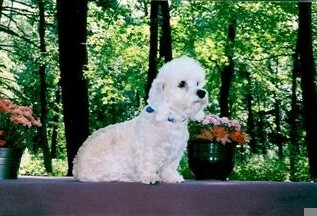 As small as they are, Dandies can also occupy themselves indoors and are very good at chasing balls and other toys. Dogs that receive very regular indoor exercise will still need to get out for their mental health, but may actually get a great deal of the exercise they need from play. As long as the family is in the house, your Dandie will probably want to be there with you. Dandie Dinmonts are happy to accompany you on longer hikes and will up. They have a great deal of stamina and will keep going as long as you can. Be careful to keep them near you at all times, and don't let them run off, as it can be very difficult to call them back. They should never be let off anywhere near traffic. Dandie Dinmonts are not particularly interested in your training regimen, so it is vitally important that you are firm, consistent, and make training sessions fun for your Dandie Pup. They love to run around and play-the less they think you're trying to get one over on them, the easier it will be. Dandies are intelligent, but just intelligent enough to not follow orders blindly. It's not that they won't take training; they just may not trust your judgement. Therefore, it is vitally important that you use positive re-enforcement to assert your position as the alpha. Punitive measures are best kept to a minimum and should be gentle admonishments. Unless you've just caught your dog in the act, there's no point in shouting at them about something they may have done hours ago. Housebreaking is the most important aspect of training to most new owners of Dandie pups. The trick is to constantly be around when they are small and not allow them access to areas where they can make a mess in the house and you'll never notice it. Many people have great success with crate training. This will allow your pup the opportunity to have some quiet time in a space he or she can consider his or her own, as well as an opportunity for early housebreaking success that you can work on. Many terriers and other dogs that were bred to hunt small underground creatures are now being trained up for Earth Dog trials. In these trials, your Dandie will go down a false warren and go after caged animals such as rats or mice. The competitions are not subjectively judged-either they pass on to the next level or not-there are no scores awarded. This can be a wonderful sort of fun training for your dog to get used to your commands with. Don't give up on your Dandie's training, even if they just don't seem to be getting it. They wouldn't give up on you.